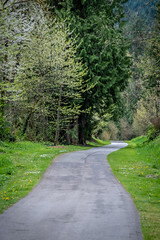 Our beautiful Snoqualmie Valley Trail has a totally new gravel base and it’s looking fresh. Check out the pictures above! Please be nice to our trails this weekend as you run the Jack & Jill’s Downhill Marathon. We’re so excited to have so many dedicated runners out on our trail this Sunday. WAHOOOO!